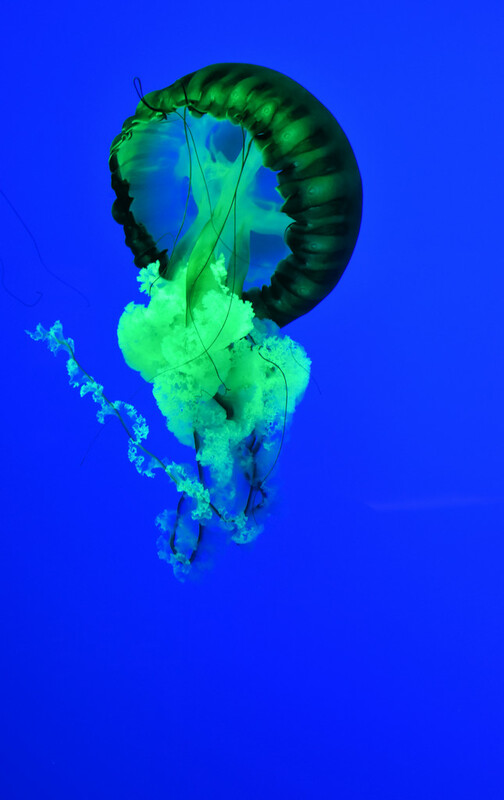 Jelly fish fascinate me. I adored watching and photographing them. I'd never gotten a good shot before this trip. I even got to pet one, which was surprising as they sting pretty well. It was slimy, yet satisfying. Wow, amazing jelly fish shot. They are so hard to photograph. @homeschoolmom I stood there for a good long time watching and shooting. They are amazing creatures! So beautiful and unique. Thanks for your kind comments, Lisa! Hope all is well and you are staying warm today! wow!!! this is amazing fabulous colours. @maggiemae Yikes. I'd be afraid to be swimming with this. Taken at an aquarium. They are so stinkin cool!!! This is anabsolutely remarkable imag! Beautiful colors! How cool that you got to safely touch one! Absolutely fascinating, this is so beautiful. fav. It's like they have parachutes!